Two science students, Catherine Deuchler ‘18, a Biochemistry and Molecular Bio major, and Papaa Kodzi ‘20, a Pre-Engineering major, will work alongside faculty this summer as a part of the Student-Faculty Collaborative Scholarship program. 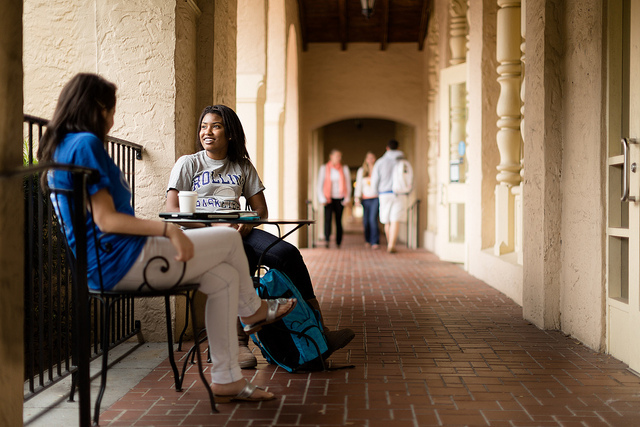 Rollins offers the program every summer and it gives students the chance to learn from their professors, conduct publishable reserach, and even get paid in the process. Deuchler will be working with Dr. Jay Pieczynski, assistant professor of Biology. Kodzi is partnered with Dr. Samantha Fonseca, assistant professor of Physics. Deuchler’s research will focus on the study of small proteins called kinesins, specifically called KLP-4. These proteins “carry things around in your cell, and so are responsible in part for cellular trafficking,” wrote Deuchler in an email correspondence. In one’s neurons, which are the cells of one’s nervous system, “they are also responsible for trafficking certain neurotransmitters, so we are looking at what mutations affect how they traffic certain neurotransmitters,” wrote Deuchler. Both Deuchler and Kodzi will be presenting their research at national conferences. The process for summer research occurs “Each spring, [when] a faculty committee meets and reviews the proposals and based on the quality of proposals, [awards funding] to as many projects as possible,” as described on the program’s page on the Rollins website. Overall, Deuchler is thankful for the experience. “I think one of the most valuable aspects of the research is getting to work directly with a professor and being trained by them. Working with Dr. [Pieczynski] and being able to learn directly about this material is an incredible opportunity to have my limits as a student stretched and pushed to a more complete understanding of my field,” said Deuchler. Students of any major are eligible to apply after their freshman year.